A boy and his grandfather are standing on a city sidewalk when they see a billboard starting Do unto others as you would have them do unto you. The boy asks his grandpa what it says and the grandpa reads it and explains the Golden Rule. The boy is intrigued by the rule and starts asking questions. The grandpa explains that each religion has their own version of the Golden Rule. They discuss what the world would be like if everyone followed the Golden Rule. The boy starts to understand the Golden Rule and the grandpa reminds him that the Golden Rule starts with one person: You. It beings with you. 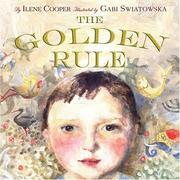 Cooper, Ilene, “The golden rule,” Children's Picture Book Database at Miami University, accessed April 21, 2019, https://dlp.lib.miamioh.edu/picturebook/items/show/11332.